Greek Early Attic amphora, 15.125 inches high, circa 530-520 BCE, with images of Athena, Ajax, Achilles and Herakles. Sold for $43,575. All images courtesy of Artemis Gallery. BOULDER, COLO.- Artemis Gallery, the boutique auction house that has become the most trusted source for authentic, fully guaranteed antiquities, Asian and ethnographic art for thousands of collectors worldwide, set a new house record on October 11. The companys 416-lot auction of art and artifacts from the most significant civilizations of the past 4,000 years grossed $1,228,510 (inclusive of 24.5% buyers premium), with after-sales continuing to add to that total. Our previous record of $812,000 was set in June, and that was a two-day sale. Like the June auction, our October 11 event was part of Artemis Gallerys Exceptional series and therefore contained the best-quality pieces, which attract the higher-dollar bidders, said the companys managing director Teresa Dodge. A Greco-Roman half-life-size carved marble sculpture of Hades in a draped cloak, dating from circa 1st century BCE to 1st century CE, displayed a high standard of artistic skill in its carving. Standing 35¾ inches high and boasting a long line of distinguished ownership, it was bid to $49,800. One of the most outstanding amphorae ever to be offered in an Artemis sale, a 15.125-inch Greek Early Attic example, circa 530-520 BCE, was expertly painted with images of Athena, Ajax, Achilles and Herakles wresting either sea god Triton or Nereus. 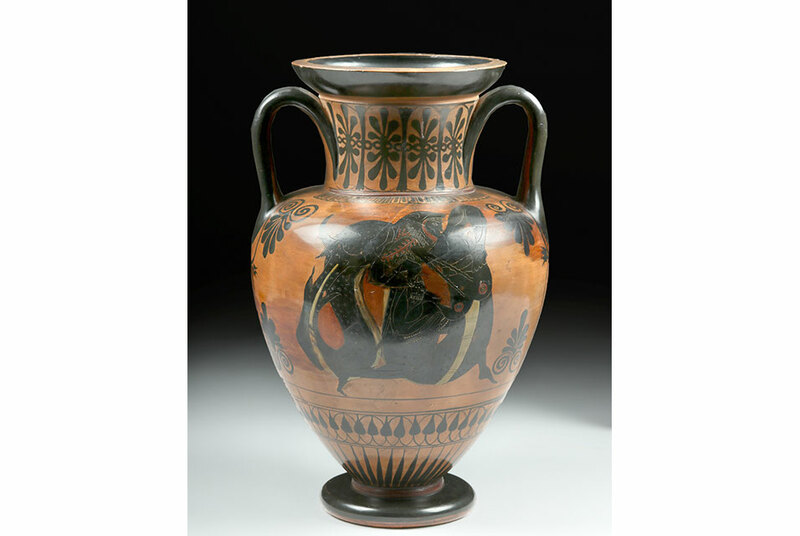 The especially large size of Attic vases made them attractive canvases for artists, who could fill them with much more imagery than other vessels of period (530-520 BCE), said Dodge. The lot sold for $43,575. Mysterious and inexplicable, sphinxes have fascinated observers for many centuries. Although the Great Sphinx of Giza is certainly the most famous of these hybrid figural structures, later sphinxes blend aspects of Egyptian and Classical cultures, possibly influenced by the cultures of those who traveled trade routes across the Mediterranean. A circa 3rd-2nd century BCE Eastern Greek marble Sphinx Trapexophoros with the head of a beautiful woman, the body of a lioness, and the wings of an eagle was one of the most visited lots in Artemis Gallerys online catalog. It concluded its bidding run at $37,350. A charming 3rd millennium BCE (Uruk period) Mesopotamian carved stone figure of a recumbent bull, with attractive deep blue lapis lazuli inlays, originally may have been a votive offering to the moon goddess Inanna. With expressive, lifelike eyes and incised details, the wonderfully modeled bovine was chased to $34,500. Other standouts from the animal world included a Chinese Tang Dynasty (circa 618-977 CE) pottery horse with gray, pink, white and black painted highlights, $21,165; and a fossilized woolly rhinoceros skull found in Rhine River gravel deposits in Germany, $42,020. From the Pleistocene period (120,000-20,000 years ago), the skull was very well preserved and, like every other object auctioned by Artemis Gallery, was guaranteed to have been legally acquired and legal to own and, if desired, resell. European woolly rhino fossil skulls can now only come from old private collections, as this one did. They are rare and coveted by collectors and will become even harder to acquire in years to come, said Dodge. In addition to Asian art and fossils, a third category Artemis Gallery has identified as fast growing is Viking and Norse art and relics. The October 11 auction included several important examples of Viking artistry, including a silver belt buckle, circa 8th-12th century CE, decorated with scenes of Viking daily life. Warriors are shown in combat as a female attends to the dead and wounded, a hunter aims his bow and arrow at a boar, and at the center, a king of the clan, or possibly Odin, sits on a throne holding a large spear, with birds perched on his shoulder and dogs in a watchful pose at either side. Estimated at $4,000-$6,000, the buckle sold for $13,695. Artemis Gallery is currently accepting consignments for its future auctions of antiquities, Asian, Pre-Columbian, tribal and ethnographic art; ancient jewelry, natural history specimens and other cultural antiques. For a confidential, no-obligation discussion, call Teresa Dodge at 720-890-7700 or email teresa@artemisgallery.com.